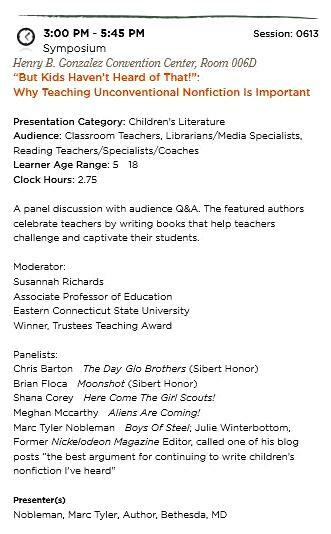 On 4/21/13, from 3 to 5:45 p.m. (yes, almost three hours! 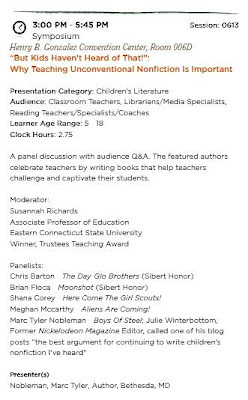 ), at the International Reading Association Convention in San Antonio, we five authors, moderated by Susannah Richards, Associate Professor of Education at Eastern Connecticut State University, will panel-discuss the importance of unconventional nonfiction...the stories that are not yet widely known, the people who are not textbook names. Please join us. This group has never assembled before, and may never again. Therefore—and speaking of nonfiction—history will be witnessed. Unconventional nonfiction will be glorified. Anderson's, booth 1003, 10-11 a.m. Overlooked Books booth, booth 2519, 11 a.m.-12 p.m.